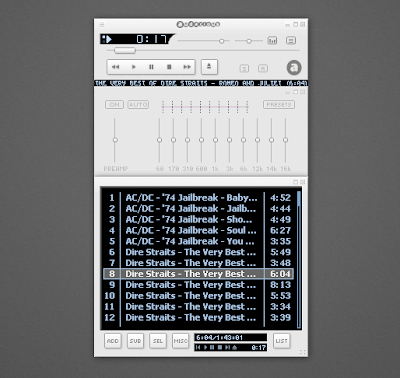 Audacious2 is a audio player that looks a lot like Winamp 2.x and it also has some similar features such as "J" for searching the playlist, song adding functions are similar to Winamp and it even supports Winamp 2.x skins. 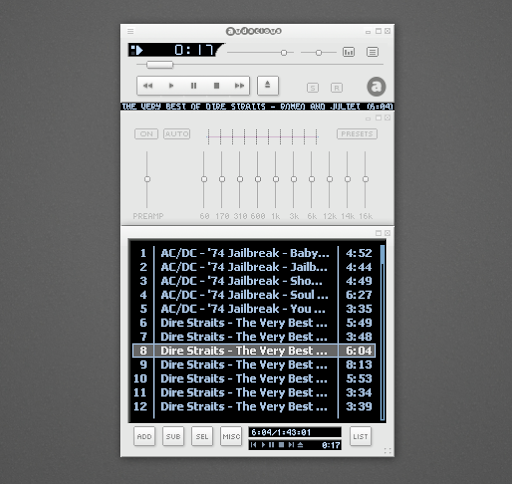 Audacious also comes with a GTK interface so if you don't like the way Winamp looks, you can always make Audacious look like your current GTK theme. Besides the usual features every music player has, Audacios also comes with a lot of great plugins: Audio Compression plugin (AudioCompressor AGC) to keep volume normalized at a specific level, Echo enhancing plugin, Crystallizer enhancing plugin, Voice Removal plugin, Sound stretching plugin, lots of visualisation plugins (Blur scope, Spectrum analyzer, RockLight and so on) and even a stream browser plugin which includes the most popular streaming directories. There's a huge list of plugins so better install Audacious and try them for yourself. Since the new Audacious2 is becoming an amazing audio player, we've backported Audacious2 2.4 from Ubuntu 10.10 Maverick (so if you're running Maverick, you can install it from the official repositories) to Ubuntu 10.04 Lucid Lynx and 9.10 Karmic Koala. Update: since Audacious 2.4 final has been released and is not yet available in Maverick, we've updated the PPA with Audacious 2.4 final for Ubuntu Karmic, Lucid and Maverick! 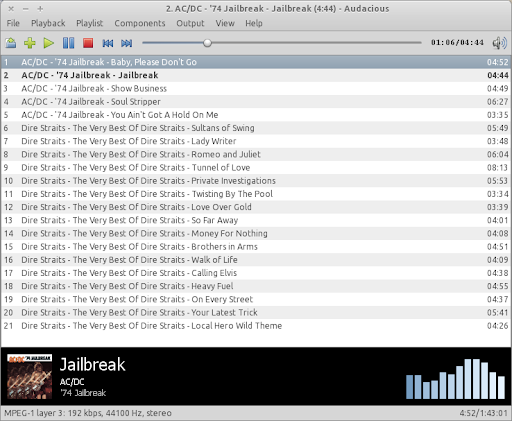 Audacious2 2.4 comes with a lot of important bug fixes, a reworked GTK interface and also the Last.fm scrobbler plugin returns, this time threadless and without memory corruption problems. As you can see, the GTK interface looks clean, simple (DeadBeef like) yet very powerful through the amazing plugins Audacious2 comes with. We've uploaded Audacious 2.4 to the webupd8team/unstable PPA (the PPA also comes with the Sezen Applet, the latest Freetype backported from Maverick as well as the latest mc). Update: initially the package in our PPA was Audacious 2.4 beta 1, but we have updated it to Audacious 2.4 final! Also, the Audacious 2.4 packages are now also available in the main WebUpd8 PPA.